Three social entrepreneurs, Manon Lavaud, Nataliey Bitature, and Keisuke Kubota, have founded Musana Carts, a San Francisco-based company, that provides urban street vendors with a cleaner, safer and more efficient solution to their cooking, storage, and financing needs. Their initial launch was in Uganda, and so far, their solar-powered food carts have already impacted the lives of 30 street vendors, giving them an otherwise impossible opportunity to run their own business. But the company's ultimate goal is to help tens of thousands of street vendors all throughout Africa! Food carts are very expensive. The typical price range for a food cart starts at around $5,000, but food trucks can be as much as $30,000. And this cost does not include the price of a power generator. But Musana Carts feature innovative technology that include an eco-friendly stove (that reduces smoke emission and fire hazards), a small refrigerator, light bulbs and phone chargers. Everything is powered by a solar panel, meaning that charcoal is no longer needed. In Uganda, the carts even include a business license because it is difficult for street vendors to obtain a license on their own. Musana also provides vendors with access to finance and business training. Manon Lavaud, strategic lead for Musana Carts, describes the carts as "a great solution for growing companies." The carts provide everything a street vendor needs to go into business for themselves. Because most vendors cannot purchase the carts outright, they are allowed to pay a small amount each month until the cart is paid off. But vendors keep all their sales revenue! After paying off the cart -- usually within one year -- vendors pay the equivalent of just $10 USD monthly in a franchise fee that ensures they continue to receive further training, branding and support. 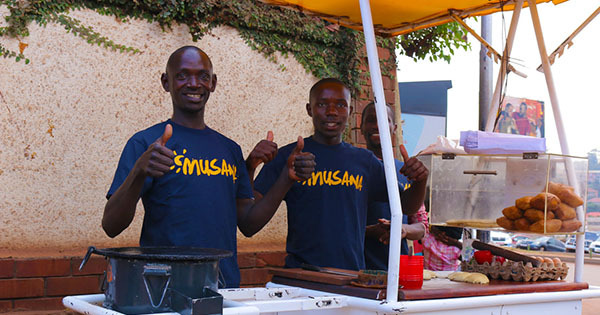 Thanks to the innovative thinking of a socially conscious tech company, Musana Carts now offer a path to a sustainable, reliable income through street vending. The carts are referred to as "the urban vending solution of the future."